Godzilla. What does that name mean to you? For me, it brings back memories of catching parts of the various 28 cinematic chapters on TBS as a kid, guys in suits stomping on miniatures, early special f/x, his little kid Godzilla trying to blow blue fire breath and of course, the all famous Godzilla roar. 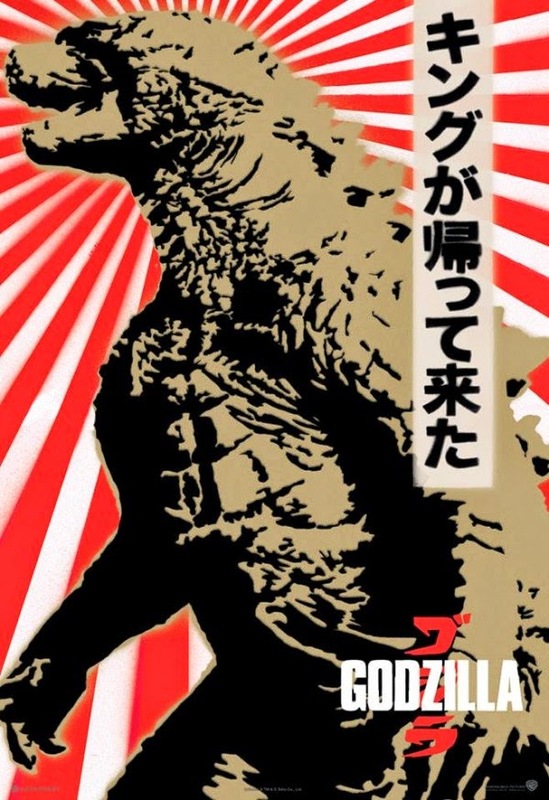 At the time of his release in Toho's 1954's Godzilla, the King of Monsters was seen as a metaphor for nuclear weapons like the ones dropped on Hiroshima and Nagasaki in 1945. 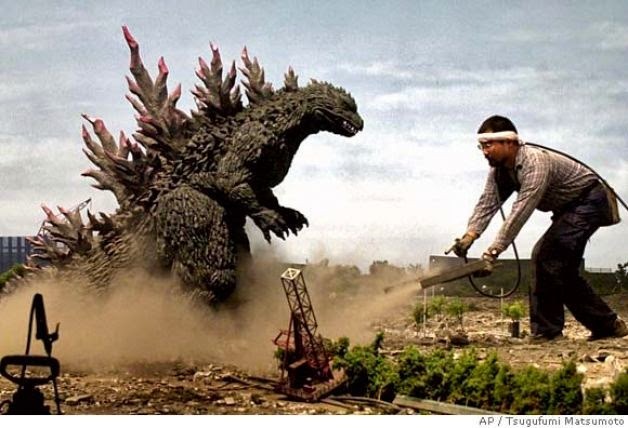 Since then, The Big Green has defended and terrorized the population of Japan fighting against and alongside the likes of Jet Jaguar, King Kong, Megalon and Mothra. While Godzilla mean "gorilla" and "whale", his appearance and history has always come from the prehistoric age and mixes Tyrannosaurus, Stegosaurus, alligator, etc. In 1998, then kings of the special f/x driven disaster/sci-fi flick Roland Emmerich and Dean Devlin brought Godzilla to America proper but the results were less than legendary. 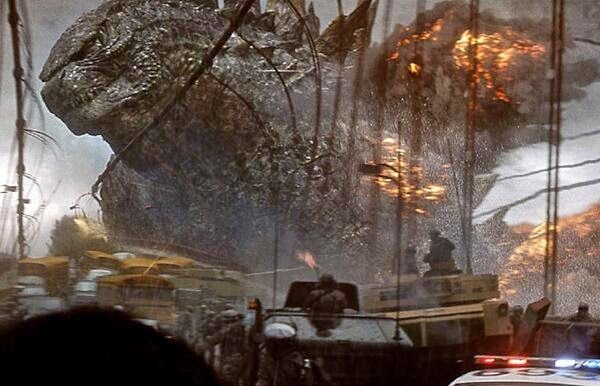 Cut to 16 years later and Legendary Pictures has brought Godzilla back to America with a big budget, summer tent pole that will crush nearly $100 million opening weekend. Following The Amazing Spider-Man 2 as 2014's latest action packed spectacle of the sequel/reboot/revamp variety, Godzilla employs another young director not accustomed to huge Hollywood budgets, Gareth Edwards. Fresh from the success of his under $1-million dollar indie flick Monsters, Edwards does a great job making the leap to studio fare. The film starts in Japan where engineer Joe Brody (Bryan Cranston) has discovered a strange, earthquake like phenomenon occurring near a nuclear reactor. Something beneath the surface awakens and the reactor is destroyed and the area turned into a quarantined zone. Cut to 15 years later and Brody's now grown up son Ford (Aaron-Taylor Johnson) has to go bail pops out of prison because he's been lurking around the Q Zone for the last 15 years trying to figure out what happened. We find out that the cause of the nuclear reactor destruction all those years ago was from the reawakening of a giant, mantis like creature dubbed Muto that has survived from the prehistoric era when the Earth was radioactive. As the surface leveled out, Muto and others like him retreated to the depths of the sea to be closer to the Earth's radioactive core. But the rise of manmade radioactive hot spots has drawn him to the surface. Dr. Serizawa (Ken Watanabe) has been following these creatures for decades, one in particular, Godzilla. Big Green arises from the ocean to hunt and take on Muto to give the world balance once again. Edwards and writers David MacCallum and Max Borenstien approach new Godzilla with an old school touch like a disaster film where we follow a few protagonists on their journeys to safety and family reunion. There's only a few human characters to keep track of so we don't have to delve too deeply into the backstory of a dozen characters a la The Towering Inferno or Independence Day. But the approach sadly back fires to a degree as the characters are thinly sketched and not overly interesting or compelling, we don't root for them, we're not concerned with their safety, they're all just there to let us know what's going on. Sure there's carnage, destruction and monster on monster crime galore but the film takes so long to build up to it that by the time it happens it's a little underwhelming. The choice to delay Godzilla's appearance is a smart one but once he shows up to take care of business, the film cuts away to some human issue right before a monster mash is about to go down and that happens several times. Don't get me wrong, there's some great stuff in the film from the Incredible Hulk like opening of news clippings and footage of nuclear tests and the rise of the mysterious beasts and cover ups, Godzilla's amazing appearance and movement, fluid action scenes, iconic shots of the monster, a flaming French kiss, nods to the original series, a nice pace, a trim 2 hour runtime and a penchant for actual sets and props VS total CGI environments. There's a familiar, low-watt, movie star free but capable cast involved who all do fine jobs no matter how brief their appearance. In the end, it's not that Godzilla is boring or ponderous, it's just not very exciting, sadly. And it's no Pacific Rim. Elbow Rocket! We saw the flick in 3D at The Chinese Theatre in Hollywood on their fake IMAX screen. There's a great statue in the courtyard of the big beast as well as posters in the lobby etc. If you haven't been to the Chinese IMAX, it's quite a nice place, beautifully decorated and of course a huge screen and giant speakers. I can't say I noticed too much 3D difference but then I usually never do because it's a sham. Just have stuff hurtling at the audience already so we know we're getting our money's worth! I can't be totally immersed in the movie when I can see the edges of the screen and the tops of everybody's heads.